Trapped in a hostile place between heaven and hell, his soul flickers between the millions of faceless infidels and good and evil forces start to use Wild Bill for their own needs. But, it turns out that nothing is as it seemed at the beginning - solve the mystery and give the equilibrium between heaven and hell a little flip! Co-op story mode that will blow your mind! Full FPS action on low spec boxes featuring mind-bending physics (Havoc©), new dynamic lighting and shader effects. A new character and an untypical story line that is totally different from the predecessors. 3 new chapters of fast pace pain-killing action! 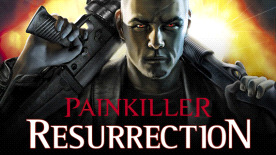 4 new unique daemonic weapons, and the beloved Painkiller is back!